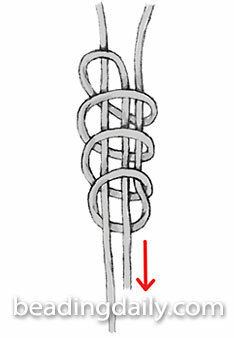 Slide knots, which move up and down a cord, are handy for finishing off leather-strung jewelry. First, place the left cord next to the right cord in opposite directions. Bend the right cord end back about 3". Coil it around itself and the left cord until you make three coils. Weave the right cord end through the coil and pull tight. Repeat using the left cord end and the right cord.